KAC's line of Micro Iron Sights are currently in use by the United States Army, Marine Corps and numerous law enforcement agencies worldwide. This is because they are built to exacting tolerances, maintain their zero under adverse conditions and, when folded, have one of the lowest profile top-rail footprints in the industry. 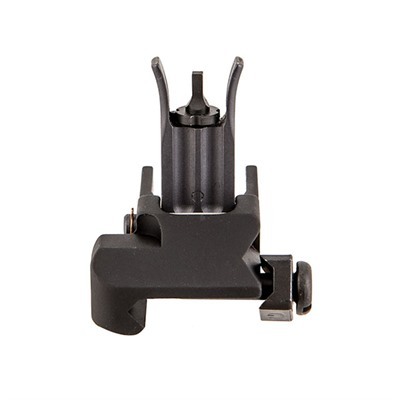 KAC Folding Micro Front Sight is no exception, and features a tool-free, finger-adjustable front sight post that makes performing sight corrections extremely fast and simple. Originally designed for the US military's SOPMOD rifle enhancement program, the KAC M4 Folding Front Sight is a low profile backup sighting solution that is designed to be attac Mfg: Knights Armament SPECS: Fits - Picatinny Rails. Material: Steel & Aluminum. Elevation Adjustable: Yes. Windage Adjustable: No.